In 1979, a young man named Andrew Stow came to Macau, to take up a career as a pharmacist. Full of ambition Mr. Stow’s interest led him to take up other business activities and he began several companies. 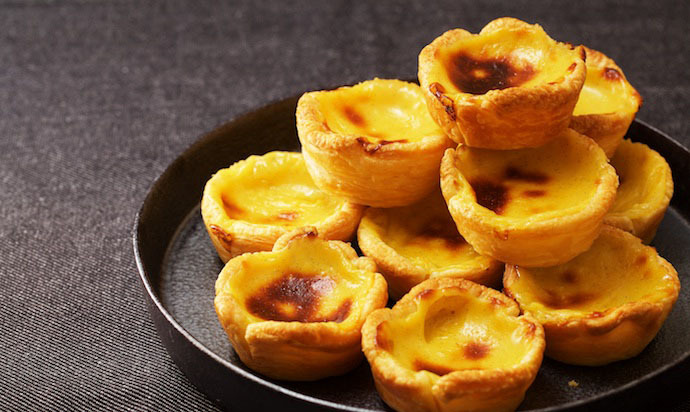 He found his cake store was the most successful of these, and in 1990 he launched his own Portuguese style egg tarts, which the people of Macau instantly adored. Mr. Stow’s egg tarts become hugely popular and the business grew. His success came at a cost, though, with the demands of a highly profitable business affecting his personal life, and in 1997 Mr. Stow divorced. Due to the popularity of the egg tarts, Mr. Stow’s ex-wife opened another shop in Macau, selling these iconic tarts and was even approached by KFC offering to buy the recipe. Since then, it is said that this European national food was introduced to the Chinese mainland. And what of Mr. Stow? Frustrated over this development, in 1998 he opened his own shop in Taiwan, which caused a new burst of egg tart frenzy. 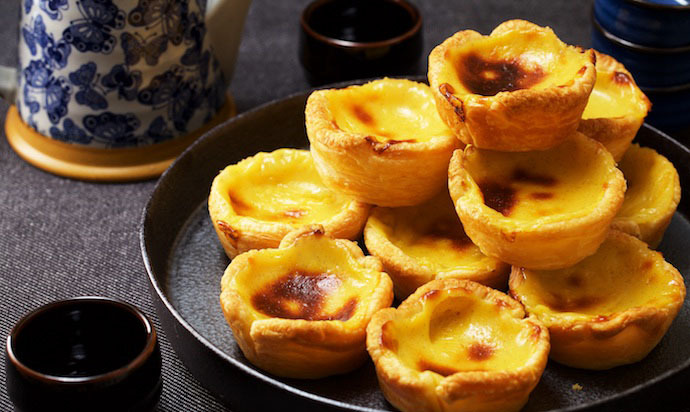 The Taiwanese people went crazy over these delicious Portuguese egg tarts and caused a big sensation. Taiwanese folks came from everywhere lining up daily for hours just to get some of Mr. Stow’s tarts. Businessmen naturally got wind of this unexpected frenzy, and would not let such a golden opportunity go by, causing all kinds of imitation Portuguese egg tarts to hit the market. Sales were so high that it affected the price of eggs on the market. Unfortunately, these good times did not last long and at the end of the summer vacation, people suddenly returned to normal, and the egg tart lines outside the shop immediately disappeared. 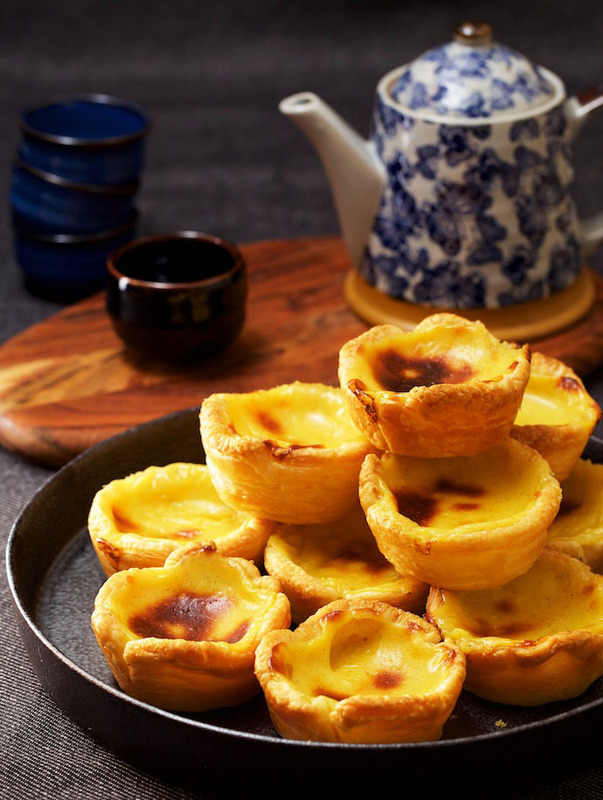 Well, that’s how the story goes, but let me show you how to make Portuguese Egg Tarts so you can see for yourself why so many people were so obsessed with them. 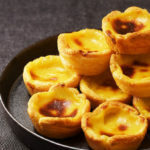 Wherever you find Portuguese-style egg tarts, whether it be in Macau, Brazil, the United States, Australia, India’s Goa area, or the Ronaldo Monastery, some say the secret lies in the filling, but others say the secret is in the tart’s pastry. It all depends on individual taste! Golden crisp tart crust, fragrant and creamy custard filling. Mmm, a real treat for your taste buds! 1. Preheat the oven to 200 C.
2. 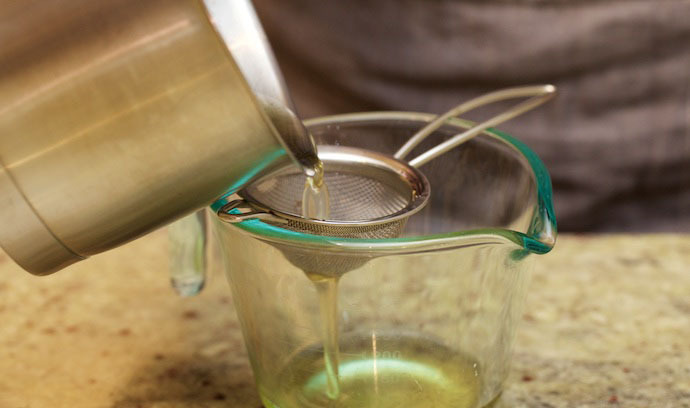 Make the vanilla syrup. Take a 16cm soup pot, add 180 ml of water and 120 g of sugar. 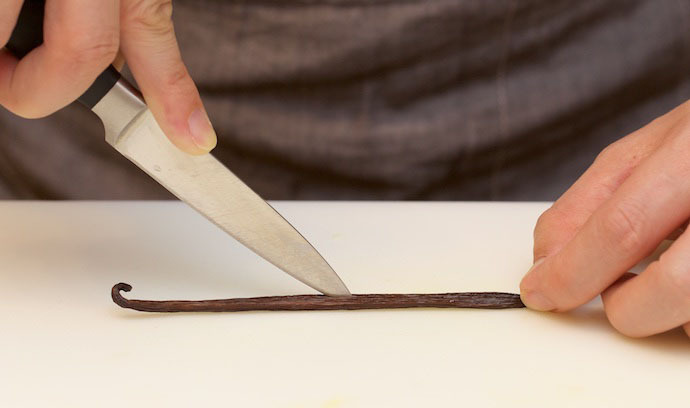 Put the vanilla pod on the chopping board and cut it lengthwise with a sharp knife. With the tip of the knife, scrape out the seeds and add the vanilla pods to the pot. Heat the pot on low, stirring constantly until all the sugar is dissolved. Turn up the heat and bring to the boil. Boil for 4 minutes, continuing to stir. Strain the syrup and set as aside to cool. 3. Make the egg yolk fillings. 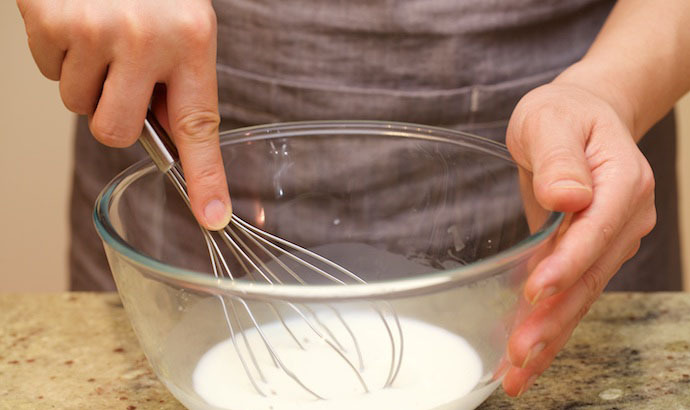 Place 35g corn starch and 125ml milk into a large bowl and stir to combine. 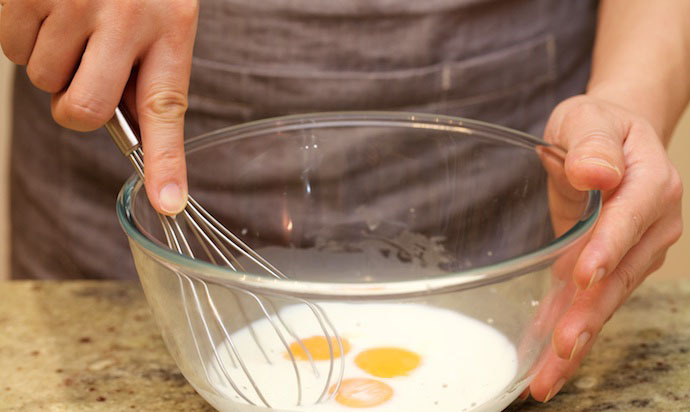 Add the three egg yolks to the milk and cornstarch mix, and stir with a fork until well combined. 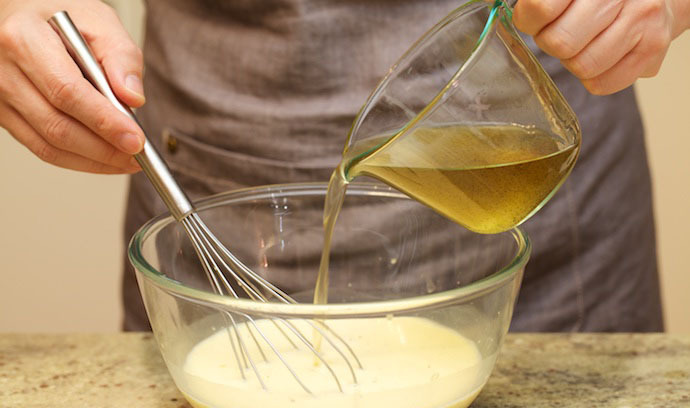 Add 250ml milk and the cooled vanilla syrup to the egg and milk mixture, stir with a fork. Pour the mixture back into the pot, and heat on low stirring constantly to avoid the egg yolk cooking and causing lumps in the mixture. Cook for 6 minutes. 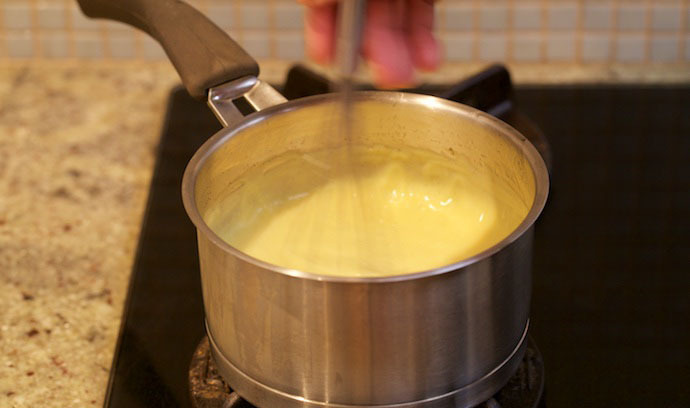 Remove the pot and place the pot into cold water so the custard cools quickly. Place the lid on the pot. Take 20g butter, and melt in the microwave oven on a thawing setting for a few seconds to soften it (note: not melt), then brush inside the tart mold. This will help make molding the egg tart easier. Take two sheets of puff pastry and place on the chopping board to thaw. Put two thawed pastries together, one on top of the other and gently roll out with a rolling pin to compress them together. Cut the pastry in half. 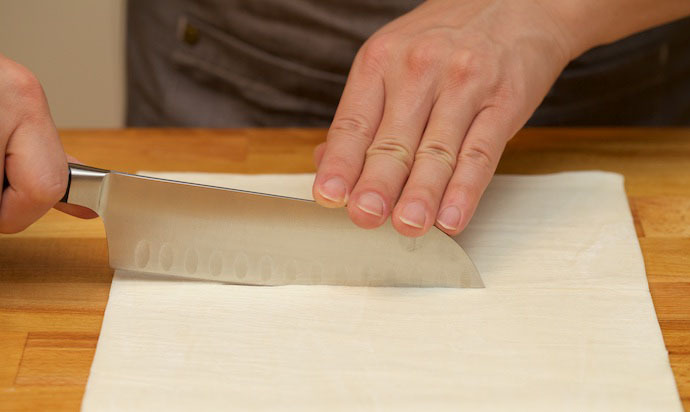 Take the short side of one piece and roll up and join by over-lapping the edge with the short side of the other piece, and continue rolling. Press evenly keeping the same thickness. 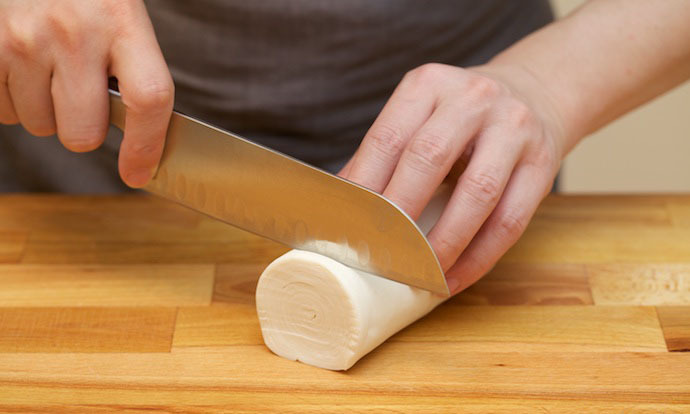 Once you have a cylinder, slice it into 12 equal parts, each about 1 cm or so. 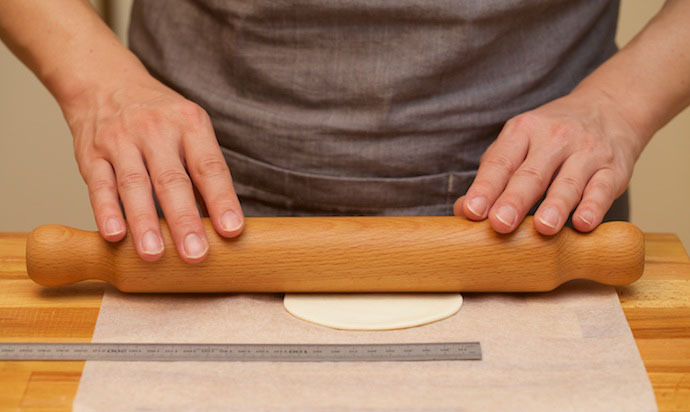 Roll each slice with a rolling pin into a flat round shape about 10 cm in diameter. 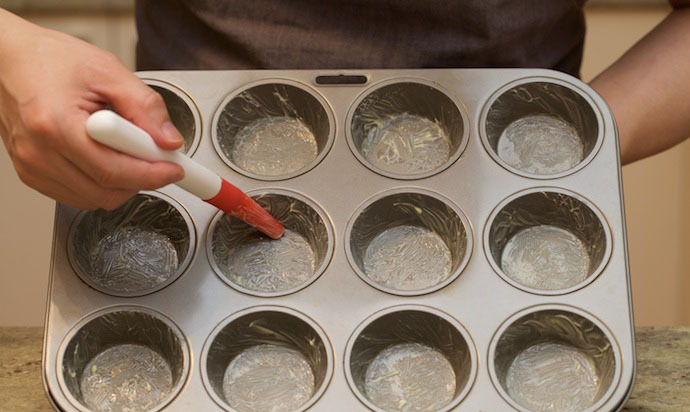 Put the tart pastry into the Mai Fen mold, and with your hands, gently flatten the sides to the mold surface. 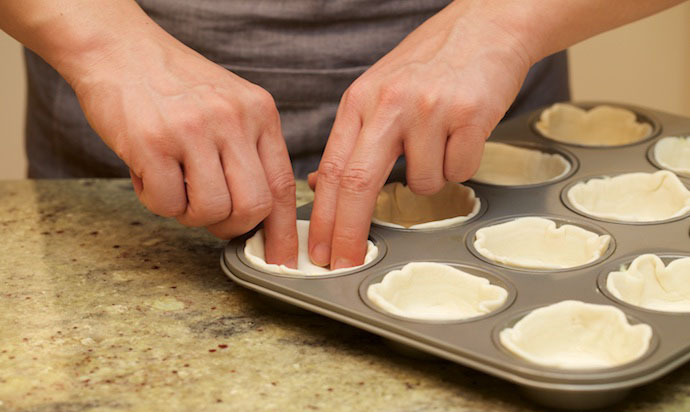 With a small spoon fill the tart shells equally and smooth and flatten the surface of each as much as possible with the back of a spoon. Bake the tarts in the preheated oven at 200 C for 30 minutes, watching closely for the last 5 minutes to check the color is right. Once the custard is golden, immediately remove the tarts from the mold, and cool on a wire rack for 5 minutes. Peel the lemon removing the rind only, avoiding the pith. The pith will give it a bitter taste. 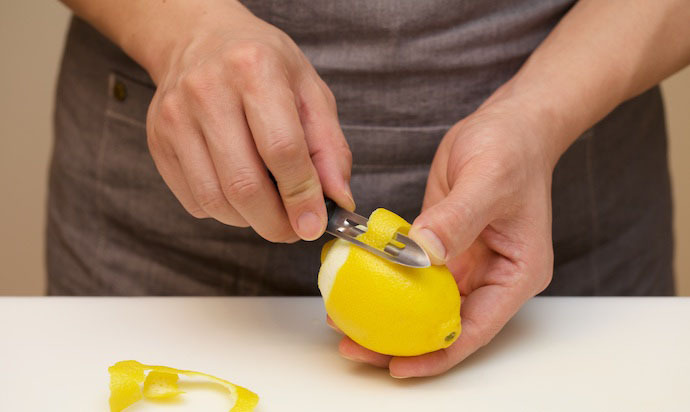 The lemon can be stored in the refrigerator to use for something else. 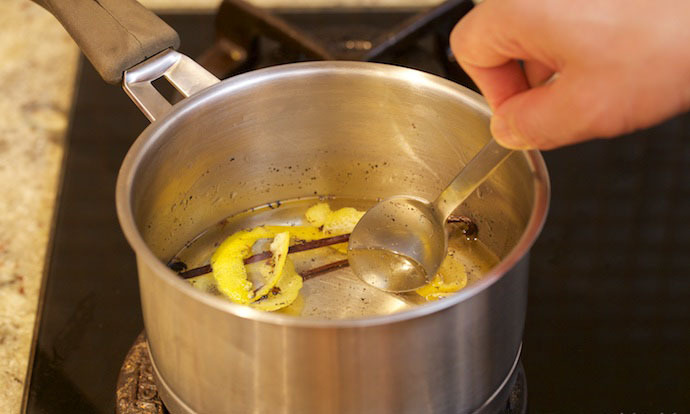 Add the rind to the vanilla syrup in the small pot. 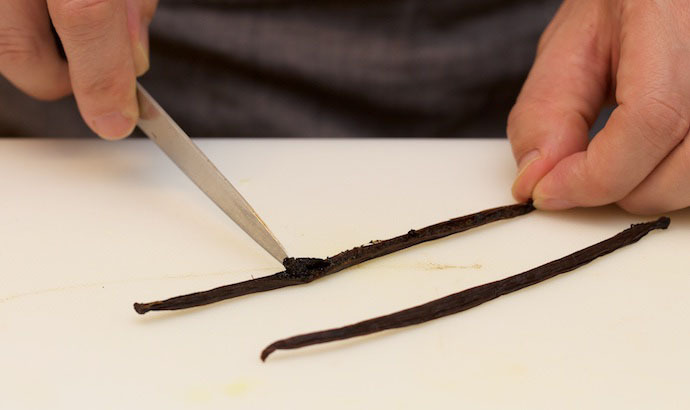 The most important ingredient in egg tart fillings is vanilla pods. 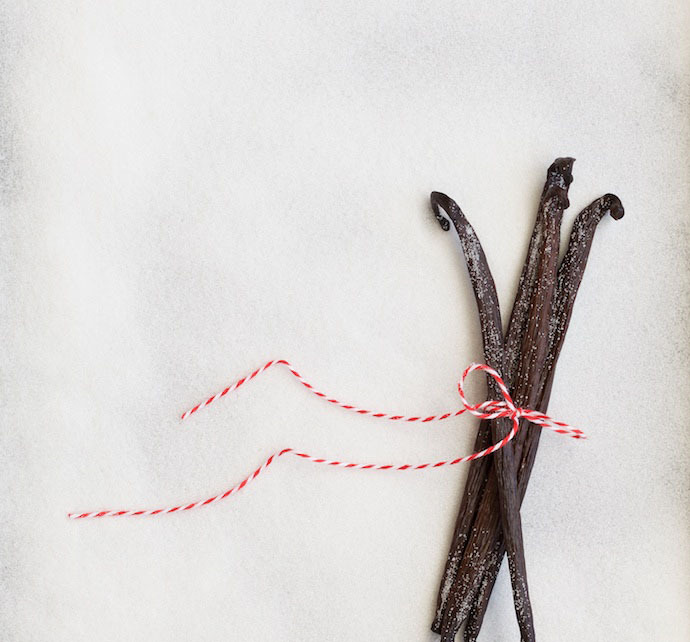 Vanilla pods are natural and give a more pure and superior flavor than vanilla essence, that will linger in your memory. Heat the pot on low, stirring constantly until all the sugar is dissolved. Turn up the heat and bring to the boil. Boil for 4 minutes, continuing to stir. Cooked vanilla syrup should be slightly sticky. 3.Make the egg yolk fillings. 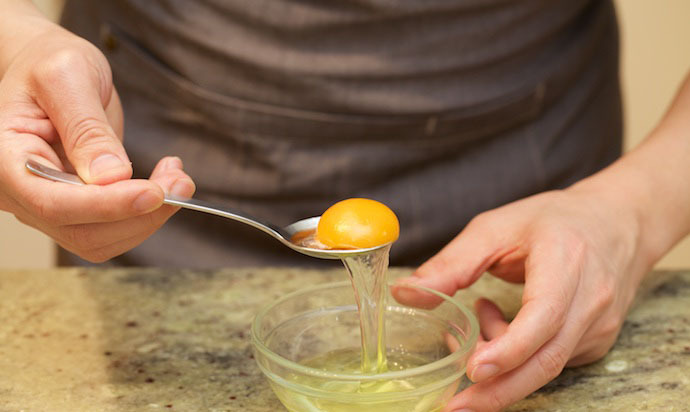 There are many ways to separate eggs, but the simplest is to crack the egg into a small bowl and remove the yolk with a stainless-steel spoon. It does not matter if a little protein is taken with the yolk – the egg custard will not be affected. The remaining egg whites can be stored in an airtight container and kept in the freezer for later use. Ordinary egg tarts have two kinds of tart crust, one is puff pastry, giving a light, crisp taste. The other is shortcakes (Shortcrust Pastry). Portuguese egg tarts are only be made of puff pastry. 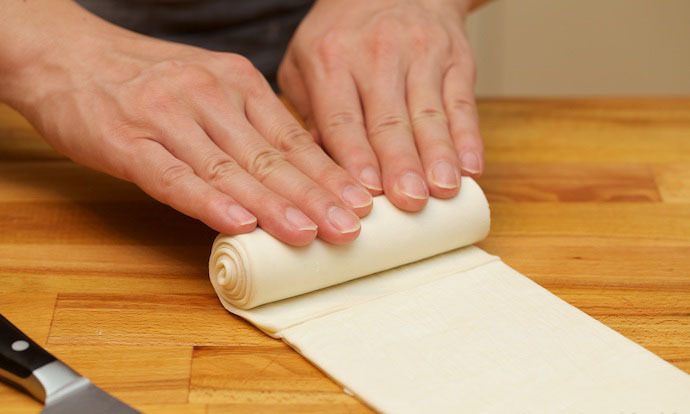 If the pastry is a little sticky during rolling, you can roll it on baking paper, or sprinkle some flour on your hands. Remove the lid from the pot of custard. There will be some condensation, but this will not matter. With a small spoon fill the tart shells equally and smooth and flatten the surface of each as much as possible with the back of a spoon. Bake the tarts in the preheated oven at 200 C for 30 minutes, watching closely for the last 5 minutes to check the color is right. 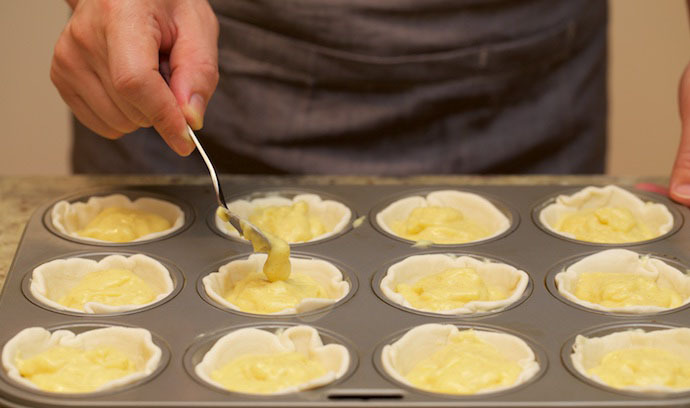 Once the custard is golden, immediately remove the tarts from the mold, and cool on a wire rack for 5 minutes. They are now ready to enjoy!